jalfrezi wrote: The Americans' have announced their participation, and if I'm honest it's a little underwhelming for a so called 'Special Partner Nation'! For those without FB - 2x F-16, B-52, KC-135, and C-17 - all static. It does say in the extended news section that they're also bringing over a UH-1Y Venom in the C-17, again for the static. Indeed, if the SwAFHF drop out, I'm asking for my money back! In fact there is less USAF static than their usually is,what about a B-1B or F-15’s from Lakenheath,aren’t the F-22 Raptors over in Europe at the moment ,pretty poor turn out for the partner nation ,but then Trump would probably have a hissy fit if he found out that even this amount of hardware was being sent considering he think’s NATO is a waste of time lol. Arrival times are up on the site now. Hello, any news regarding this? Also, it is still possible to come really early and get to Albrechticky by car? Looking at their own map, there only seems to be a small section that is no entry. jalfrezi wrote: Arrival times are up on the site now. Either the B-52 has cancelled or it’s akready arrived?? It was due at 12.05 local, so should have arrived already. There are now reports of organisers putting "no entry tapes" around much bigger part of that field between Albrechticky and showgrounds than it is shown on the map. Probably from the level of C taxiway (third taxiway from the south) northwards. Anyone on the site who could confirm? Confirmed by the organiser that the field is closed. I do not know the exact area though, looks like it is more or less the entire area between the showgrounds and Albrechticky (people say "300m south of radar", "level with taxiway C", "opposite the tower"). The area is marked by tape and the violation of no-entry should be enforced by security. Fields surrounding that particular area are fine to sit in . Did the Lansen turn up? Abbo46 wrote: Did the Lansen turn up? Yep,nice display ,lots of loops ,Viggen took off and did a couple of passes but landed so assuming it had a problem ,Draken did a great display aswell,Czech Gripen was good and tiger camo jet. Yesterday the field was a little muddy but not that bad ,mainly flat and hard ground,no rain yesterday so should be drier today underfoot. Park with everybody else in the show ground and then walk into the show and do the static then keep walking right round to the other entrance and exit(go left and follow the road and you get to the fields. So with my friend we decided to stay on the parking field (the official one this time) to see the first displays and the flypast. This location was quite good until 1200lt approximately. We were much closer than inside the static display and finally, we decided to stay a little bit more, despite the backlit conditions to go to the static display at around 1500lt. At the end of the day, we had to walk 2.5km back to the car. This time we parked the car inside the official parking, we stood there until 1200lt then decided to go near to the terminal building, just under the demo axe on the eastern part of the airfield. This was really good, we had aircrafts turning right above our head and it allowed me to take very nice pictures, almost no crop is needed on 90% of the pics with my 100-400L. Sun was behind us until the end. Except some trees, this place was almost perfect, with the airport building 200m away from us to go to the toilet/buy something to drink. The only thing is that you can't see any take off/landing from there and that some aircrafts/helicopters stay more on the other side of the field, where the public is. The polish F16 did all the flares on the other side of the runway for instance. Regarding the display programme, as everybody, I was dissapointed when looking the USA participation, same thing with the Slovak Mig 29 but finally they where here and did almost a demo. I was also really surprised by the YAK40 absence in the flypast/static display at least. So I will probably go there again next year but I will clearly go early and we will stay there for departures also as the static display was really interresting, and made me eager to see more of this aircraft in flight. With an estimated 100k visitors each day, traffic is always going to be a massive problem. Saying that though, we arrived when the car parks opened at 6.30am and parked up straight away - you definitely need to get there at the crack of sparrows, though it does mean you then have to hang around until 8.30am when the gates open. 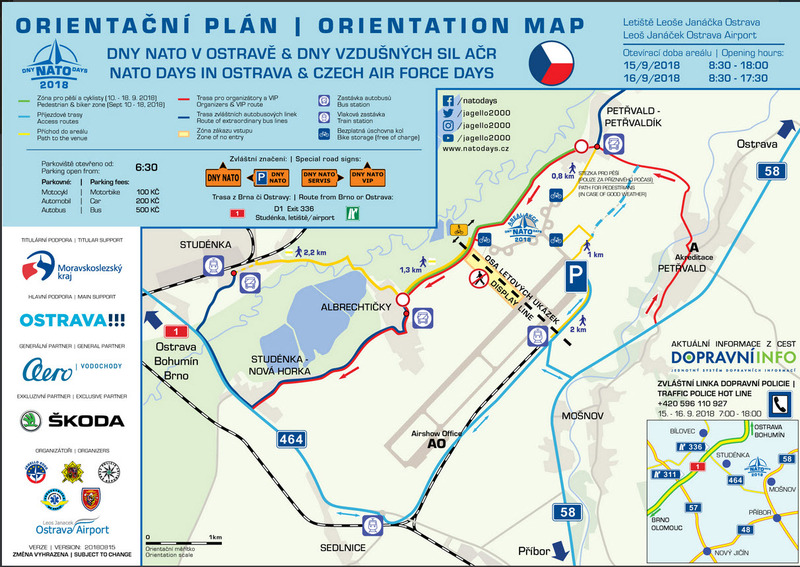 "Czech Flare" - Nick Jennings reports from NATO Days in Ostrava for UK Airshow Review.